Citrus × aurantium var. medica (L.) Wight & Arn. Citrus limetta subsp. murcica S.Ríos et al. 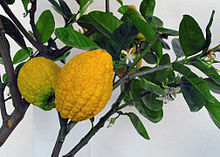 Citrus × limonia var. limetta (Risso) Engl. Citrus medica var. proper Hook.f. Linnaeus, C. 1753. Species Plantarum, Tomus II: 782. USDA, ARS, Germplasm Resources Information Network. Citrus medica in the Germplasm Resources Information Network (GRIN), U.S. Department of Agriculture Agricultural Research Service. Accessed on 07-Oct-06. For more multimedia, look at Citrus medica on Wikimedia Commons. This page was last edited on 30 March 2019, at 13:30.